Coffee Fest Nashville 2017 has officially begun! 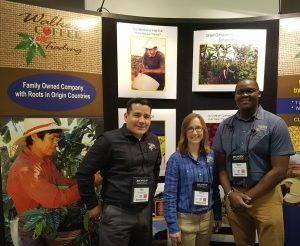 If you’re in the area, stop by Booth 307 and have a chat with Danny, Robinson, and Heather about our coffee offerings. New to this show is our booth’s sitting area, where you can sit down for a one-on-one chat with our coffee experts or just kick back and relax with the Walker Coffee team’s hospitality. We’re happy to treat you to some good old fashioned customer service! Previous Previous post: Remembering Warren Muller, Sr.
Next Next post: YES, HOUSTON ASTROS! !